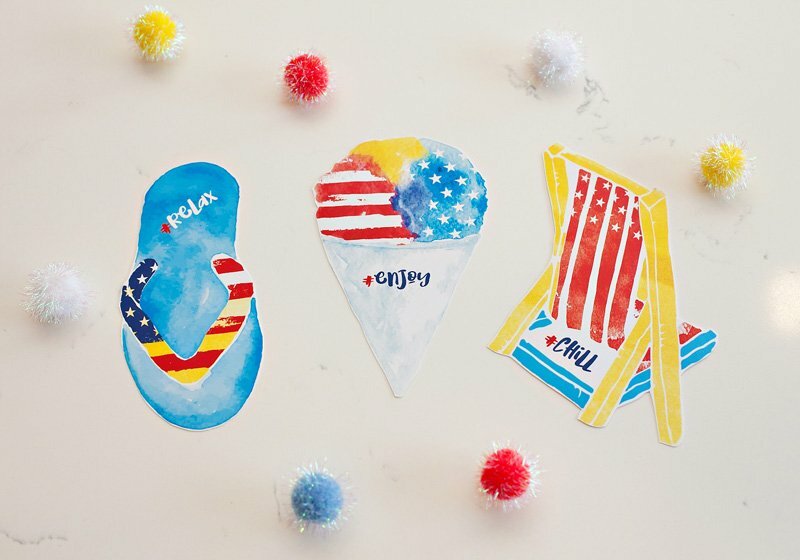 First up is a brand new set of free printables featuring summery icons, patriotic colors, and playful sentiments. Even though Labor Day is a sign that fall is right around the corner, the weather is still very warm and summery in most of the country (it’s still in the 90’s where I live!) – and I wanted these designs reflect that “end of summer” feeling. 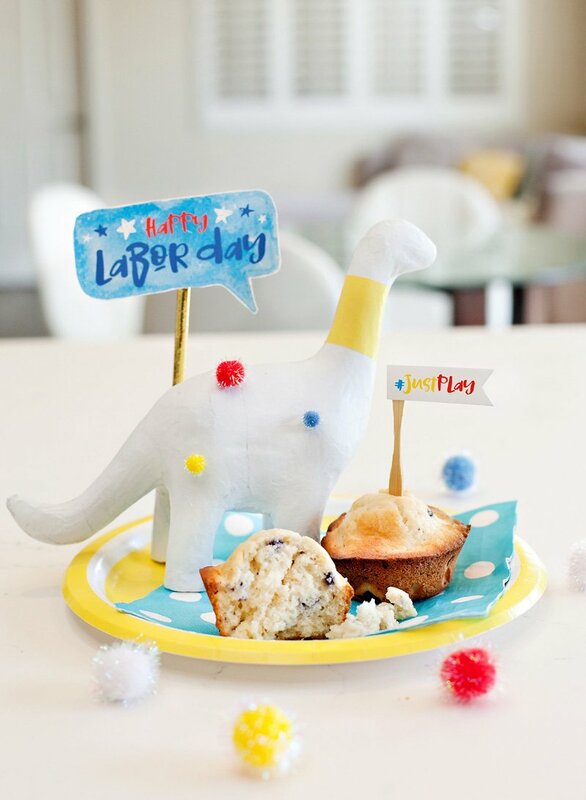 – and Talk Bubbles that can be used with my playful dinosaur centerpiece shown here – or just on their own. 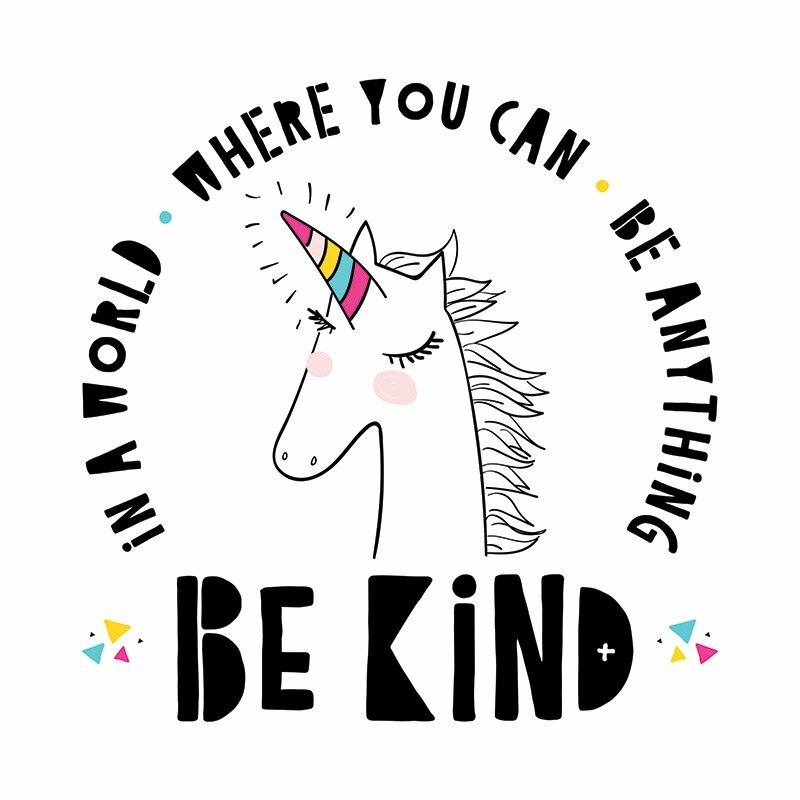 I also love the idea of just taping the talk bubbles to a bedroom door or bathroom mirror, so that it’s first thing your loved one sees when they wake up! 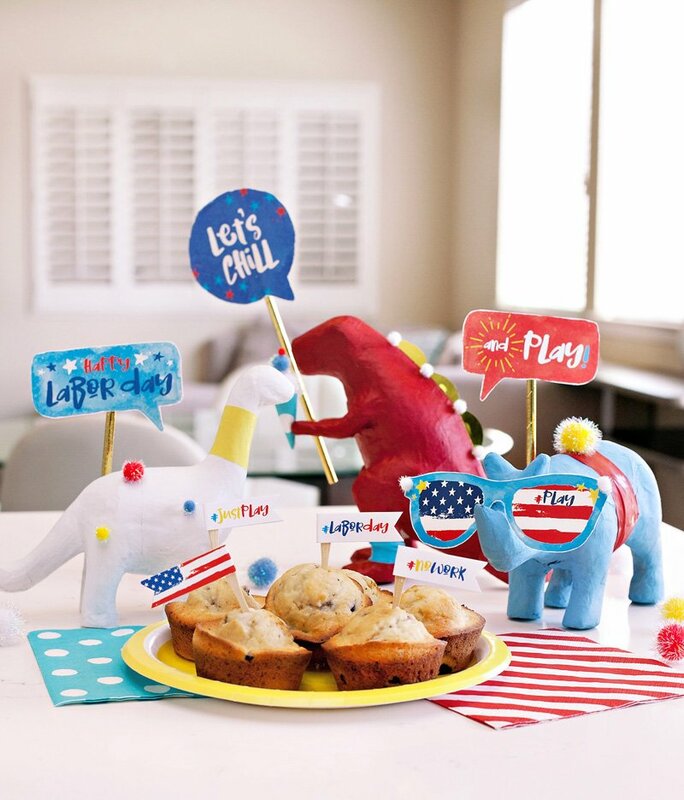 I felt inspired to come up with something fresh and unexpected in terms of Labor Day decorations, and ended up with this Patriotic Party Animal Party trio, because…. why not?! ;) Actually, I’ve got 2 little ones of my own, and like to dream up things that will make them happy… and we’ve been eyeing these inexpensive paper mache animals in the craft aisle at Target for a while now. 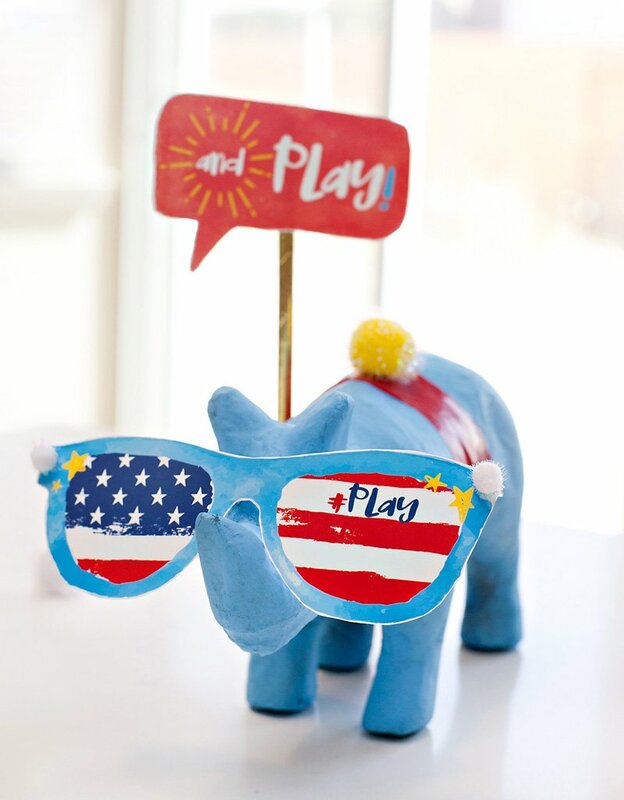 To recreate this look, just paint the animals in patriotic colors using spray paint or craft paint. 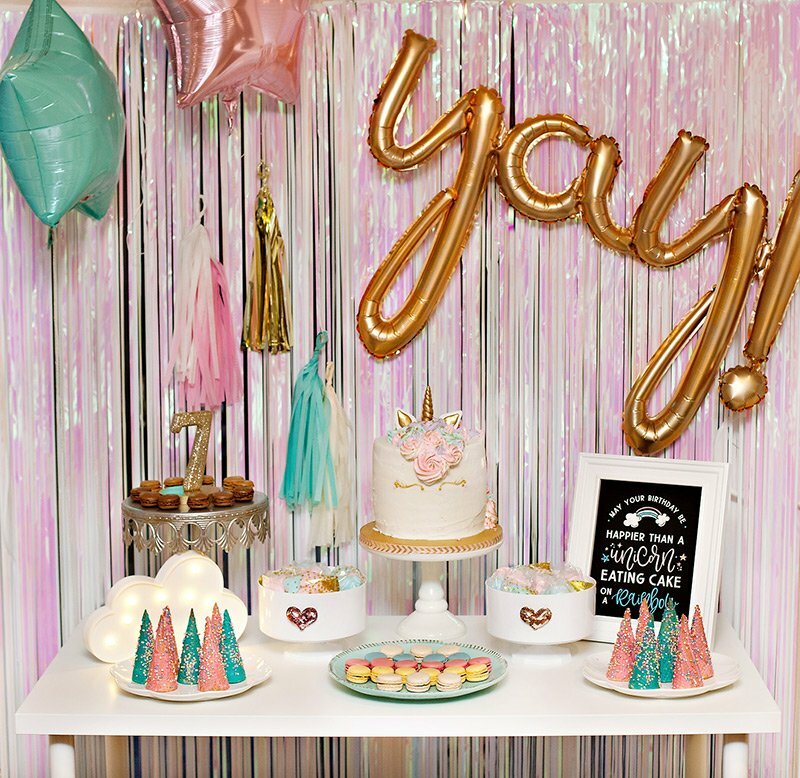 Decorate them however you like – I glued on little craft poms and stretched pieces of balloons around them for added color. 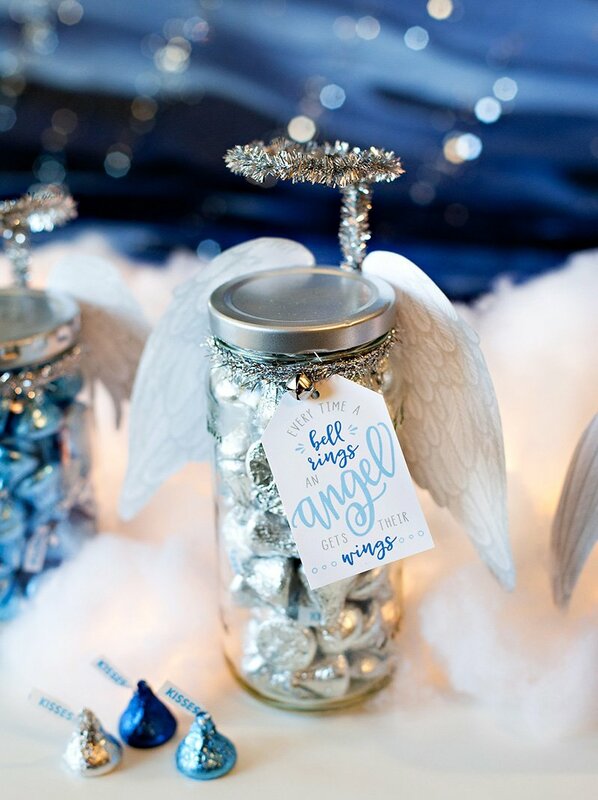 (This is also a fun project to let the kids help with if they’re old enough!) 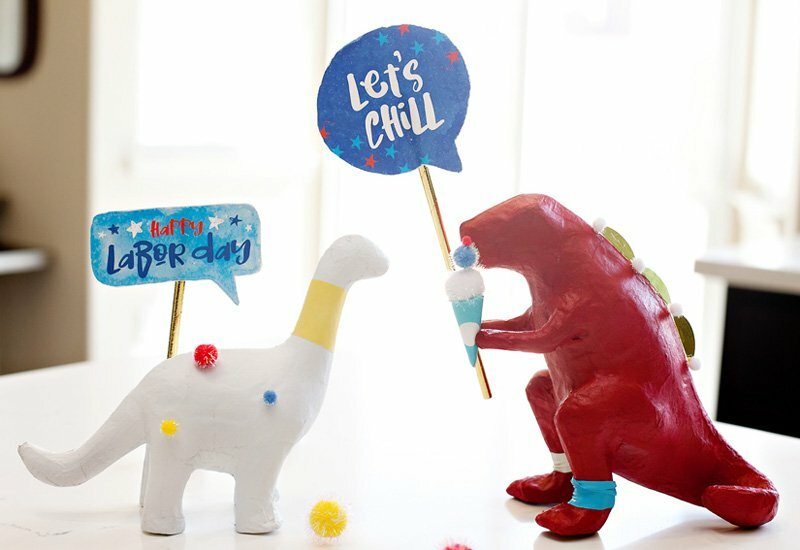 The “ice cream cone” that the red dinosaur is holding is made from a little piece of a paper napkin rolled into a cone shape + more of the craft poms. 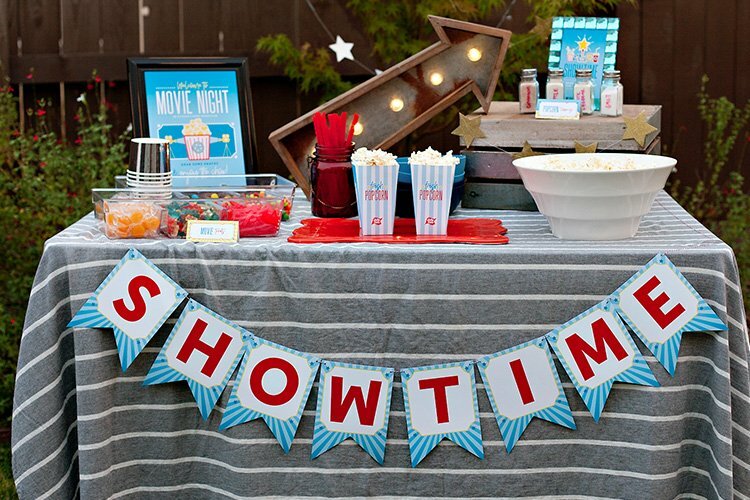 For the finishing touch, add the printable talk bubbles on party straws… and a set of printable sunglasses! 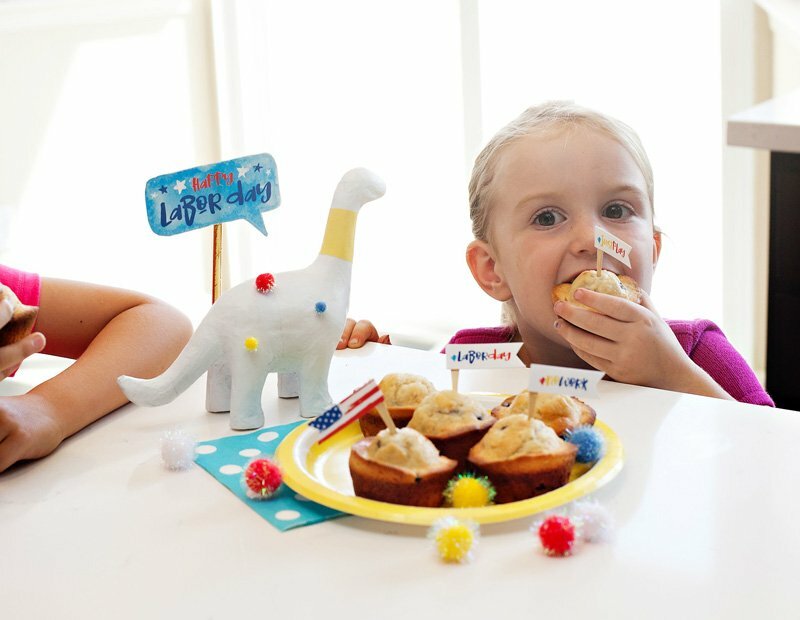 The party animals look cute in a trio or just on their own… especially accompanies by a plate of yummy treats, of course! 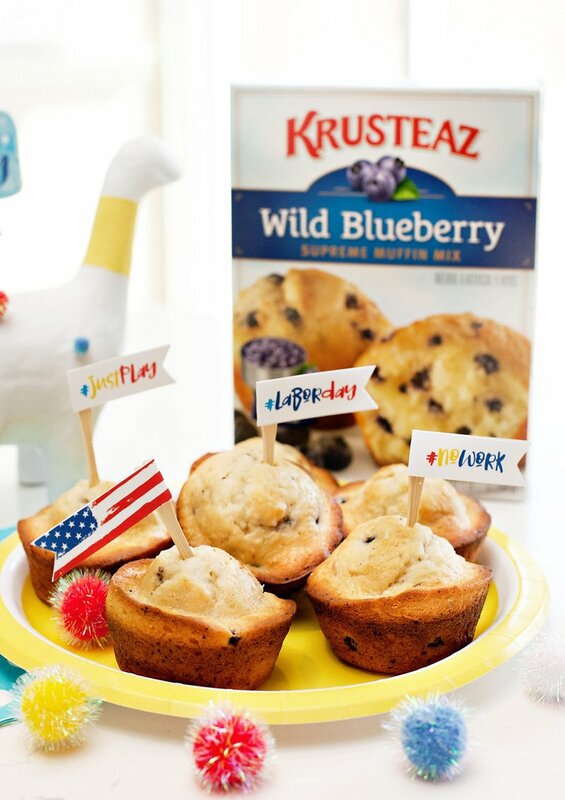 Little ones will love waking up to the smell of Wild Blueberry Muffins or being surprised later in the day with a tray of Snickerdoodles. 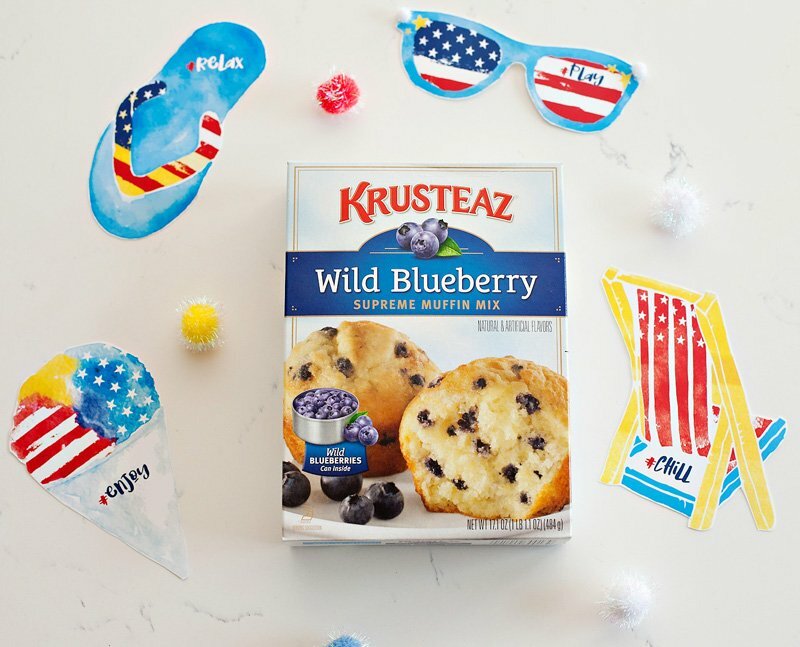 I love that Krusteaz mixes take the “labor” out of baking so there’s more time for crafting (and playing!) on Labor Day. 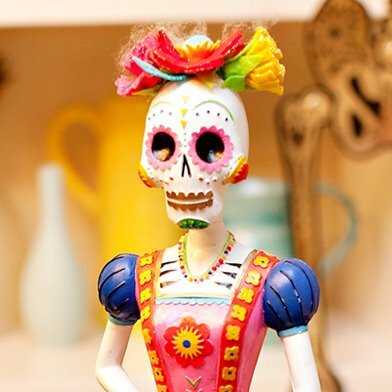 No time for crafting? No worries! 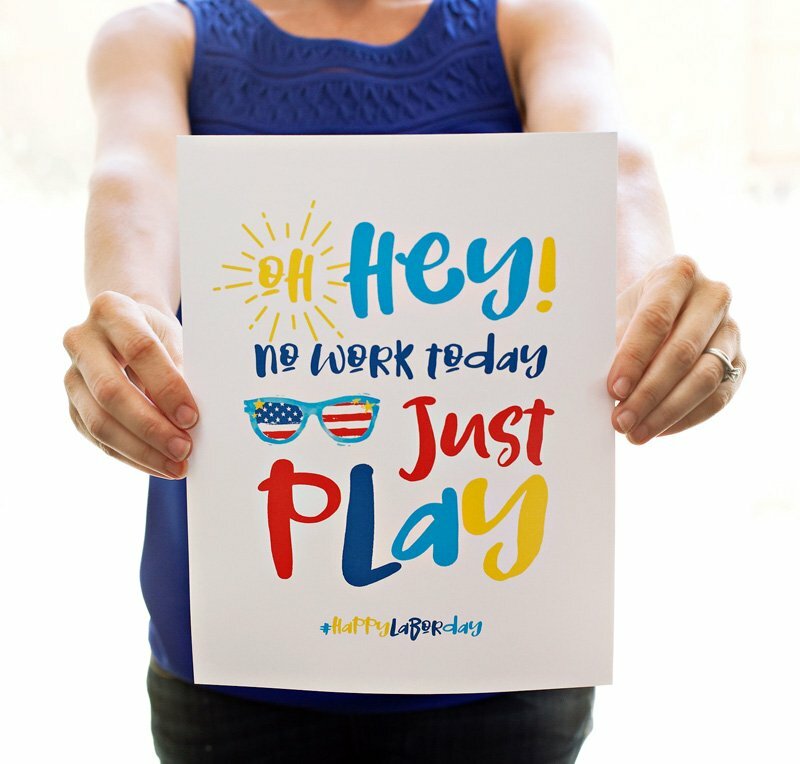 Print out my Labor Day Sign and display it in a frame at your get together for quick and easy decor, or tape it to a loved one’s door or car window in the morning as a not-so-subtle hint! 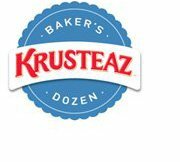 This project is brought to you in collaboration with Krusteaz®. As always, all thoughts, designs, and opinions are my own. THANK YOU so much for supporting the companies that make it possible for me to keep the creative inspiration & ideas coming your way!